Africa Array, initialized in 2004, is a project that aims to establish research and training programs in the geosciences for Africans, within Africa. The continent is rich in mineral, petroleum, and geothermal resources and demand for trained geoscientists to manage these resources is growing. However, this need is not being met. To address this need, Africa Array is developing specialized education and research programs involving universities in the US, Africa, and Europe. Although the project ultimately aims to expand its training model to include many geoscience fields, the current focus has been on geophysics. In particular, seismic and geodetic observatories are being installed throughout the continent. UNAVCO's role in the project began when, in August 2010, it provided engineering support for the installation of six continuously operating GPS stations in the countries of Botswana, Namibia, Zambia, and Malawi. These installations also served as training sessions for AA collaborators from the University of Witwatersrand and the Council for Geoscience in South Africa. These individuals will be responsible for the installation of 19 additional GPS sites later this year at various locations around the continent. With one exception, the six sites installed were co-located with AA seismic stations. These sites are on the properties of public and private institutions including local geologic surveys, meteorology offices, and universities. The largest threat to equipment safety at these sites is vandalism. For preventative measures, all GPS antenna monuments were installed on the rooftops of concrete buildings. The GPS receivers are stored in the closest possible offices in each building. All equipment runs off of independent solar power. Upon completion, the Africa Array GPS network will be composed of four Trimble NetRS and 21 NetR8 GPS receivers. Each site will have a Trimble choke ring antenna with a tall SCIGN dome. Additionally, Vaisala WXT 20 meteorological packages will be co-located (also on the rooftops) within 10 to 15 feet of each GPS antenna. Figure 1 - The primary field team for the UNAVCO-supported GPS installations and training. 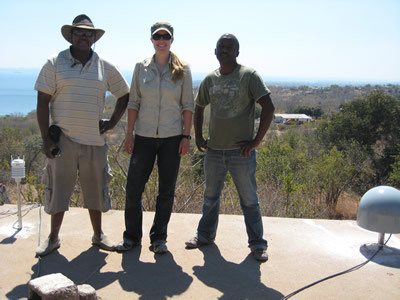 From left to right, Zibusiso Gumede (University of Witwatersrand, South Africa), Sarah Doelger (UNAVCO), and Robert Kometsi (Council for Geosciences, South Africa). Mr. Gumede will be continuing with GPS installations in Ghana and Cameroon in October. 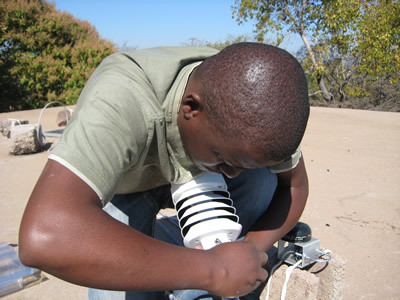 Figure 2 - Robert Kometsi installs the Vaisala meteorological package on the rooftop of the Africa Array seismic vault in Itezhi-Tezhi, Zambia. 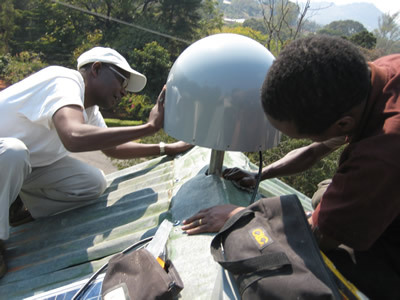 Figure 3 - Winstone Kapanje (left), a local collaborator with the Geologic Survey of Malawi in Zomba, helps to install the GPS antenna on the roof of the Survey office building. Fred Tugume (right, a Ugandan PhD student at Penn State University), joined the field team for training in Malawi. Tugume will be installing two other Africa Array GPS stations in Uganda and Tanzania in mid September. 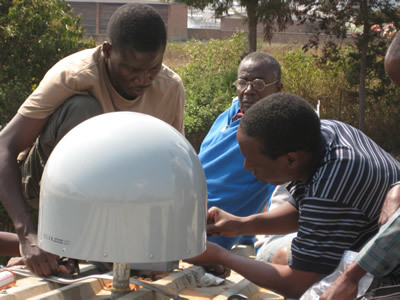 Figure 4 - Fred Tugume and other seismologists of the Malawi Geological Survey adjust final settings on the GPS antenna in Mzuzu. The antenna is mounted on a 1.25 inch steel pipe which is drilled through the corrugated iron roof and grouted into the cement building below.